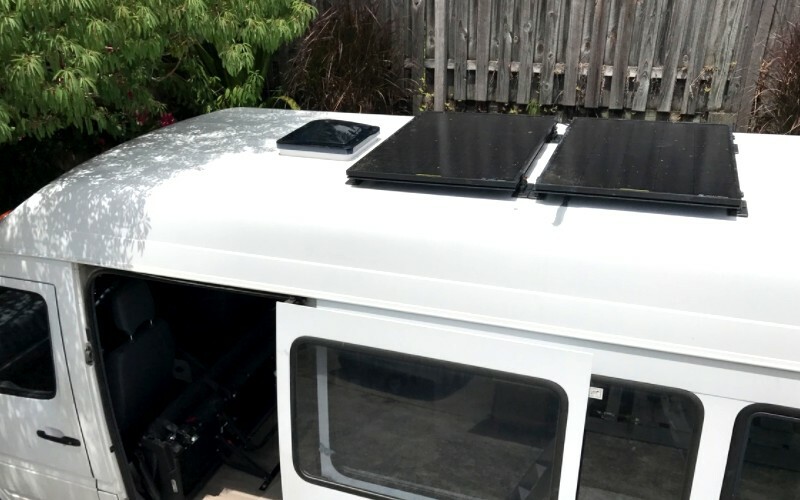 After being overwhelmed by what other people had done we wanted to find a simple campervan solar setup for our Sprinter van that we are taking around Australia with our 3 kids. We settled on the Yeti 1250 solar generator with 2 x Boulder 90 solar panels on the roof. As a family, we wanted to be able to power everything from our juicer and blender to laptops and phones and knew the car battery just wouldn’t cut it. We also looked at DIY solar options but they all just looked so complicated and overwhelming. Thus we wanted to find a large solar generator that could provide us with a lot of power, but without the hassle of wiring everything up ourselves. 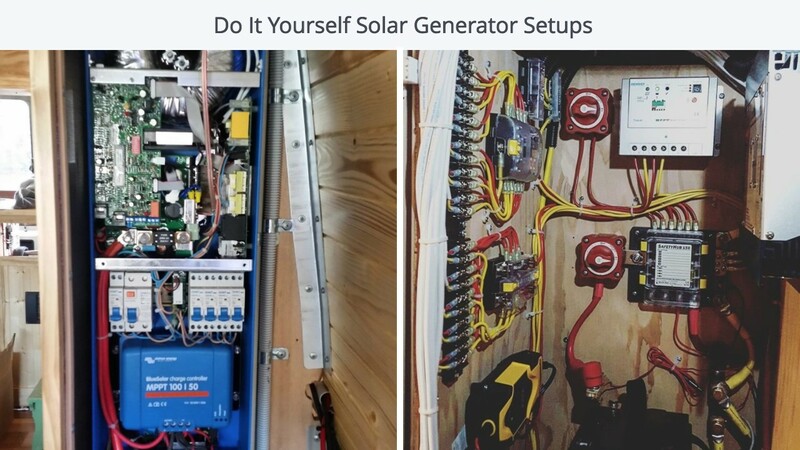 Before we get into our super simple solar setup let’s have a look at these instagram photos of DIY solar setups just to get a reference point for how hard it can be to create a solar setup in your van. We want something that is WAY WAY WAY easier than this! After a bit of searching I found the Goal Zero Yeti 1250, which is a solar generator/battery pack in a class of it’s own. Rather than just being a battery with a 12V or 6V output it has a variety of different outputs all built in. 3 x 100V AC wall plugs (2 x 240V in my Australian version), 3 x 12V outputs, 3 x 5V USB outputs + 1 x mini-anderson output. So rather than buying a battery and then an inverter to convert the battery into useable wall plugs, this has every potential plug you need completely built in. As I write this no other battery has that. So yeh, the Yeti 1250 is super simple because in terms of creating output plugs there is no wiring required, it’s all on the battery itself. This immediately removes the hardest part of your solar setup. You pay a bit more because of this, but in my opinion it is totally worth it as it takes up way less space and is a lot less work. There are 2 things to look at when choosing a battery. Storage capacity and maximum output. Storage capacity tells you how much energy you can store, maximum output tells you which particular applicances you can run. The Yeti 1250 can output a maximum of 1250 watts (and it stores 1,200 Watt hours). My blender uses 400-800 watts which means I can use that. You can get smaller batteries like the Yeti 400 or the Yeti 150 which are cheaper and have less overall storage but they also have less output. So if I was to buy a Yeti 150, which has a maximum output of 150 watts, I couldn’t run my blender because it requires 400 watts of energy to run. So just be careful when choosing your battery. Choose on storage amount AND look at maximum output. BONUS: A thing I liked about the Yeti 1250 was that it has huge maximum output for a battery (1250 watts) but also I can connect another 1,200 watt battery to it to double to storage space if that is needed. I’ll do a full article on understanding battery storage and output in the future. Once you’ve got your battery you now need a way to charge it directly from the sun, aka solar panels. The guide times for charging the Yeti 1250 battery using just 1 Boulder 90 solar panel was 27-54 hours of sunlight. That’s like 2-5 days which was just going to be too slow for us. 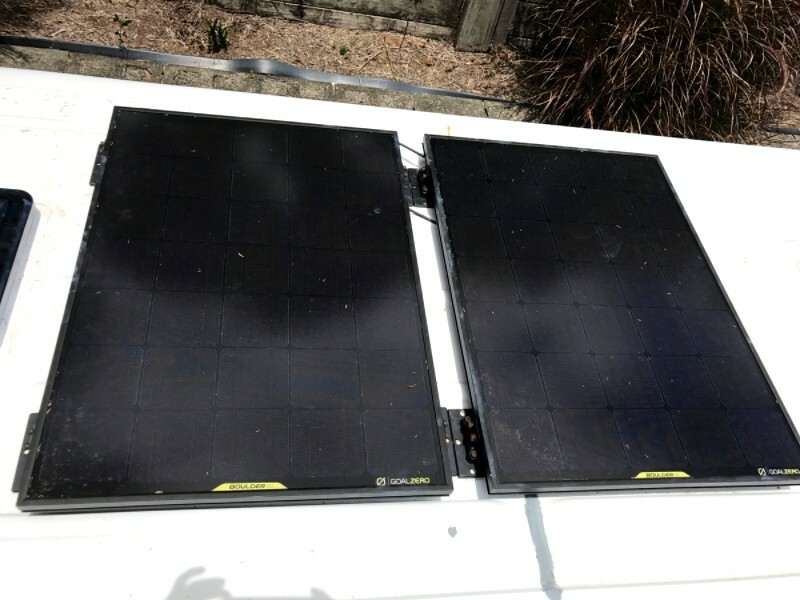 So we opted to get 2 of the Boulder 90 solar panels which we secured to the roof of the van (will talk about that in a second). So we got 2 Boulder 90’s and chained them together like in this little diagram (this is called “series”). Boulder 90’s are Goal Zero’s biggest panels and they turned out the be the perfect size to install on the roof of my van. This is going to get slightly confusing but I’ll try to keep it as simple as possible. The Boulder 90’s uses connectors called MC4 connectors. You’ll notice there’s no MC4 connector on the Yeti so you need to use an adapter. Each Boulder 90 comes with a MC4 to 8mm adapter for free. If you’re just using 1 panel (not 2 panels like I am) then you can use the adapter just fine. 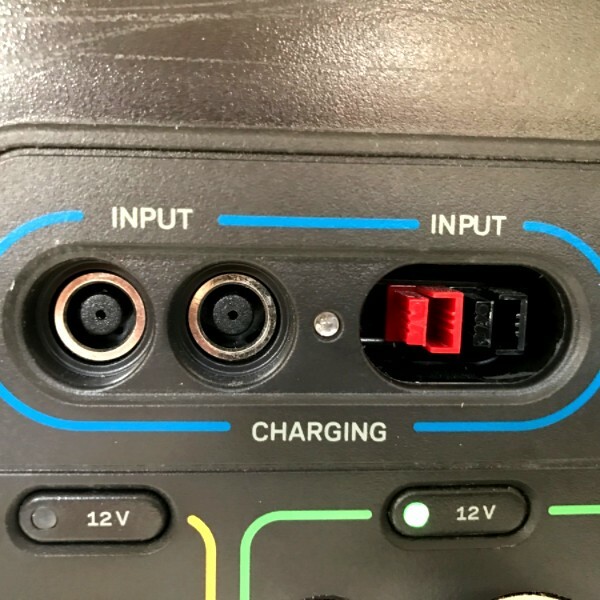 You’ll just want an 8mm extension chord to run from the solar panel on the roof into your Yeti and your van as the chord that comes on the panel is quite short. 1 Boulder 90 with this adapter and an extension chord would work perfectly if you get the Yeti 400 instead of the Yeti 1250. The Yeti 400 is smaller, cheaper and faster to charge, but obviously has less storage capacity and less maximum output. 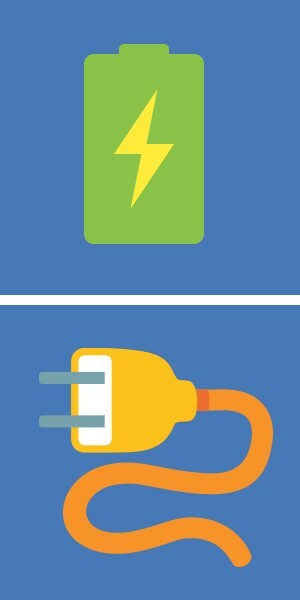 If you’re using 2 panels you’ll want to connect them in series as mentioned above. 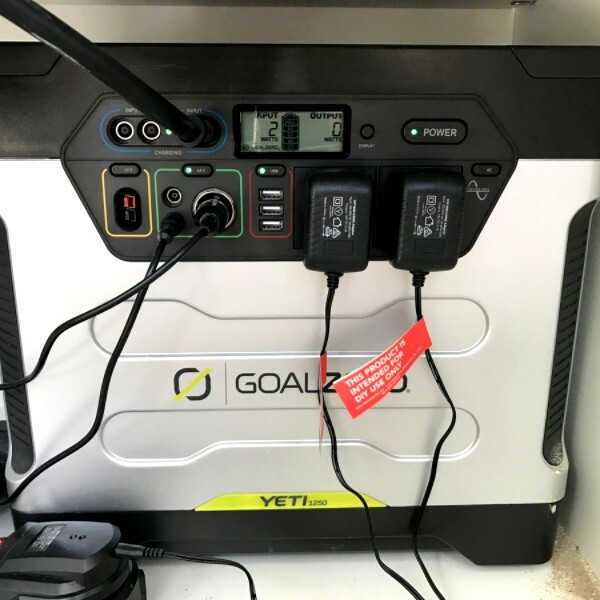 When plugging two Boulder 90 Solar Panels into a Goal Zero Yeti 1250, you will need to purchase the MC4 Solar to AP Adapter Cable to handle the current. The two, round 8mm ports are designed to be used with Goal Zero Solar Panels. Each port can handle up to 160W of power – the combined total cannot exceed 240W. The Anderson Powerpole port is designed to be used with third-party solar panels and can handle 240W of power. This means you can’t connect your 2 x Boulder 90’s together and then run them through an 8mm extension chord. The combined 180W of power is more than the max 160W the 8mm port can handle. So it’s a waste. Instead, you need to buy an MC4 to AP Adapter Cable. 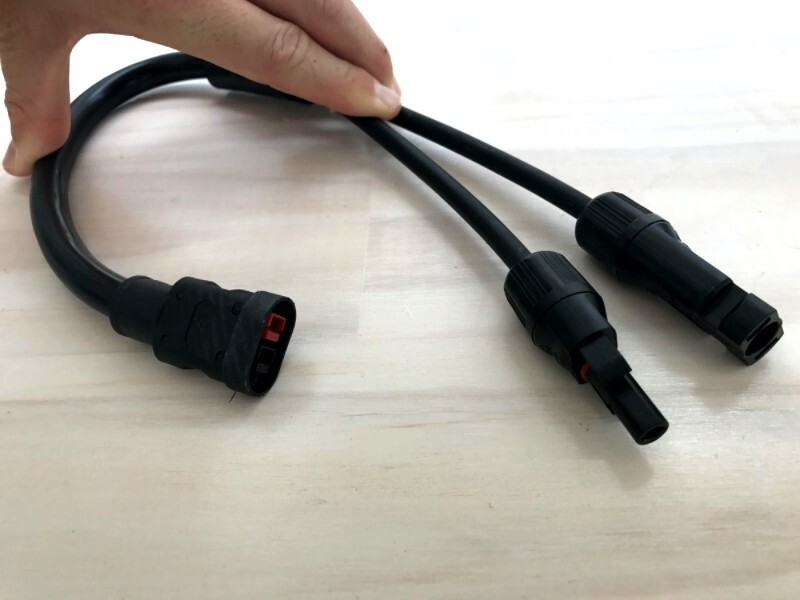 The AP Adapter Cable plugs straight into the Yeti, but again you’ll need an extension cable to reach your panels on the roof. 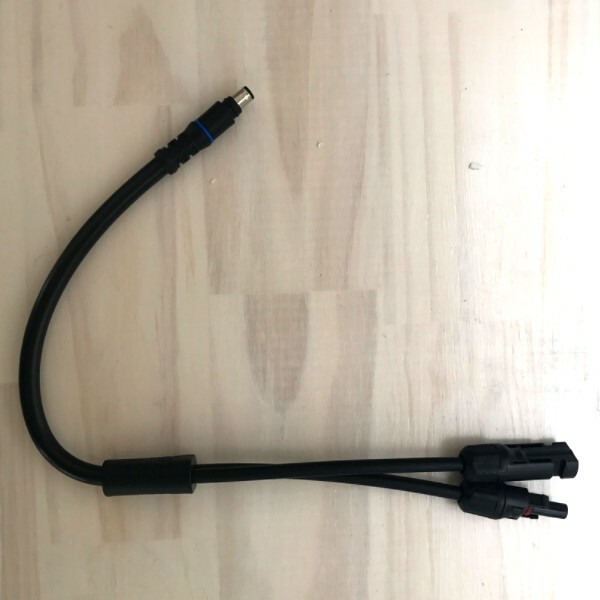 So you’ll need 2 x MC4 extension cables. I used 2m cables and it just made it, if I could do it over again I would use a 3m extension cable. To summarize what I’ve outlined so far, here is the chain of getting energy from the sun into your battery. The Goal Zero Hinge Base Sets are really easy to attach to the Boulder 90 panels. What we did was put 2 hinge brackets on each of the longer sides of the solar panels, allowing 10cm (4 inches) of space from the edge of the panel. Thees just click into place and then screw in to secure them firmly. Really easy to do. Once the hinges were on we lay them on the roof and marked out where they would sit. We then used a 50% isopropyl alcohol/water solution to clean where the hinges would be in contact with the roof. 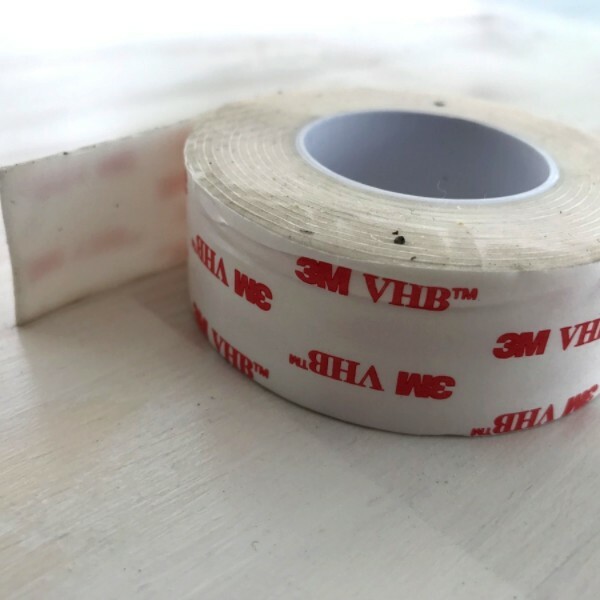 We then put down the double sided 3M VHB 4950 tape and rolled into onto the roof applying firm pressure using a beer bottle as our rolling pin…only thing we had lying around. We then put the hinges on the top of the tape and pushed down to apply as much pressure as possible. This tape is meant to replace welding and have 90% of it’s strength in 24 hours and 100% within 3 days. The first panel we felt really confident about as it was really strong, but the second panel wasn’t as strong for some reason. So for safety and peace of mind we added 1-2 metal screws with washers to each of the brackets. We then covered these with, likely way too much, silicon to make them waterproof. The MC4 cables from the Boulder 90 panels are long enough to run into the roof. So I drilled a hole in the roof using a multi-layered drill bit. This drill bit allowed me to slowly increase the size of the hole so I could have the smallest hole possible in the roof. I then put the cables through the hole and attached the MC4 extension cables inside the van. We then put a layer of clear silicon that can handle really high heats (in northern Australia the roof becomes like a hot plate) followed by a 2nd layer of white silicon. We also did the same on the inside of the van. There was no art to this, we just tried our best to completely fill the hole with silicon and create a good seal around the hole so no water could get underneath. We probably used the wrong silicon and probably used too much of it but once it was dry it felt really secure and we had massive rain a few days later with no leaks. 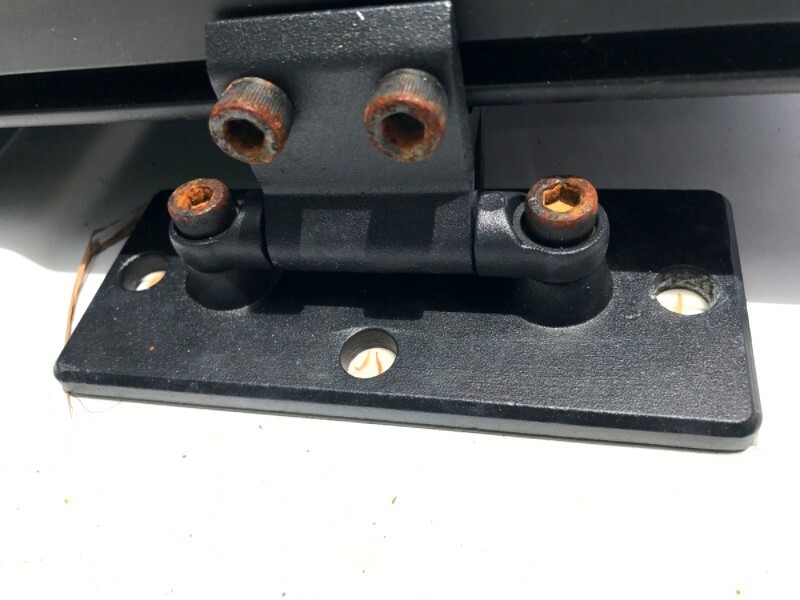 The bolts in the Goal Zero Hinge Base started to rust within a week which I was really disappointed with. I mean these hinge bases weren’t cheap and they are obviously going to be outside. Plus I have seen this rust on another Boulder 90 campervan setup so it must be a flaw. Instead of removing the brackets and starting again I simply replaced the bolt with ones that hopefully won’t rust. The last finishing touches I did was to build the interior roof panels over the cables inside the van (I ran the cables before I added the roof panels on) and I ran the chord into the cabinet that held the Yeti 1250. Ok to quickly review everything we’ve gone over. I connected 2 x Boulder 90 panels in series and stuck them onto my roof with Goal Zero Hinge Brackets, 3M VHB 4950 tape and metal screws with washers. I then ran the chords into the van using a multi-layered drill bit and sealed the hole with heat-resistant silicone. Inside the van I connected my MC4 extension cables to the Boulder 90 cables now poking through the roof. I then used the MC4 to AP adaptor cable and plugged that into the Yeti 1250. I now have 180 Watts of power coming into my Yeti 1250 battery that I can use to power our family adventure. I hoped this helps you with the solar setup for your campervan as I found it hard to find any instructions online for what to do. If this was helpful please consider using the product links in this article as they are amazon affiliate links, thanks so much if you do. So there you have what I believe is the absolute easiest solar setup for a campervan ever. No crazy wiring or electrical skills required. Just plug a few things in and drill a couple of holes and you’re done!